As per data, the number of passenger flew dropped to 113.49 lakh in February compared to 125.08 lakh in January. The overall cancellation rate of scheduled domestic airlines for the month of Feb 2019 has been 1.89%. 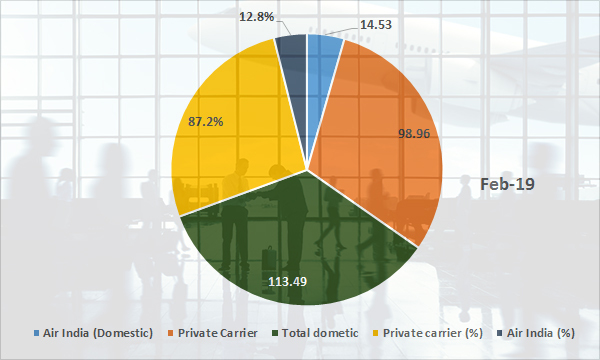 As showed in pie chart, of the total passengers carried by private carriers dropped drastically to 98.96 lakh in February compared to 109.78 lakh in January. Passengers carried by Air India dropped marginally to 14.53 lakh in the same period under review compared to 15.30 lakh in January. However, during the first two months of 2019, passenger traffic grew to 238.56 lakhs compared to 222.09 in the same period a year ago, recording growth of 7.42%. According to the data, low-cost carrier SpiceJet had the highest passenger load factor (PLF) -- a measure of capacity utilisation of an airline -- at 94%, followed by GoAir at 92.6%, AirAsia India at 91.8%, Vistara at 89.1%, and IndiGo at 88.4%. Air Heritage had reported passenger load factor at 96% in February.